It's been a REALLY good week ~ being back in the groove of "school" has agreed with everyone in our family. While I believe we are learning all the time, getting back to some of our formal studies after nearly a month off has felt good. These collages are turning out to be highlights of our week. It's impossible to fully document our whole week this way, but it's sure a good start! 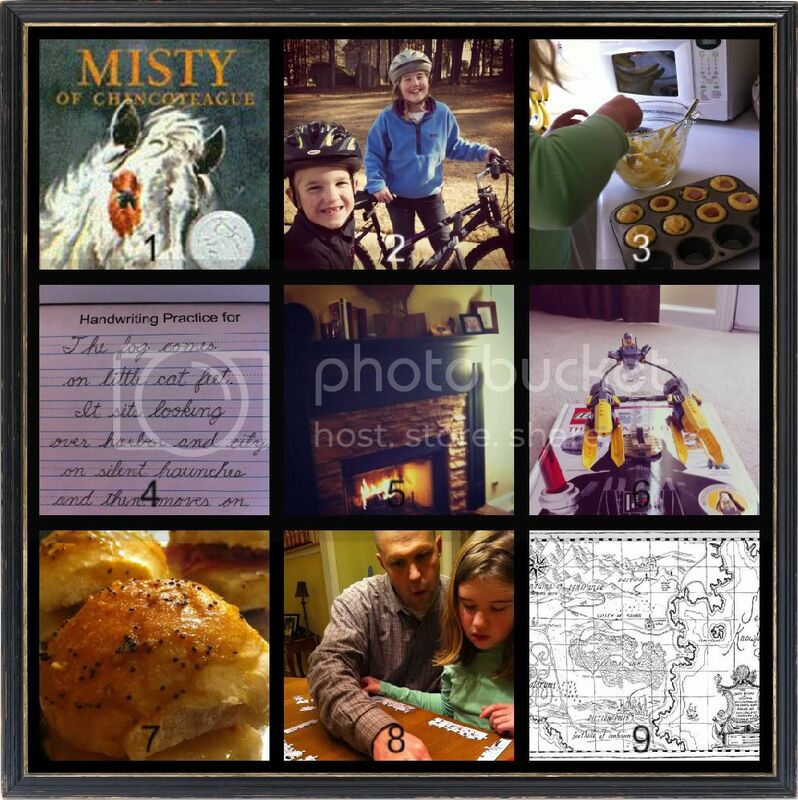 Feel free to link your own collage... and grab the cute button from my sidebar for your post or blog. (Need help making a collage, click here.) I think it's a fun way to document our weeks, dont' you? Wouldn't it be great to print the collage each week and keep a record of your weeks that way? 1. Miss B's current read is Misty of Chincoteague. We've read King of The Wind aloud, and I thought it might be nice to have her start the Misty books. Did I mention she's completely obsessed with horses, too?? I'm requiring her to write a book report on this one, because she will be required to complete one for an upcoming homeschool literature fair. 2. The weather warmed up at the end of the week so we went on a few bike rides. The kids each have new (to them) bikes. I walk, and they ride bikes - we go about 2.5 miles each time and it's good exercise for all of us. 3. Miss B has been working on some home making skills. I have had her prepare lunch this week. Tuesday she met Jiffy Corndog mini muffins and they were excellent! 4. We have been learning a lot about Carl Sandburg this week. 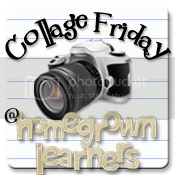 (Check out the read-aloud Thursday post to learn more.) I've been printing their poetry copywork from Handwriting Worksheets - if you don't know about this site, you should! 5. It was COLD here early in the week - lots of school by the fire! 6. The Lego obsession continues. Gman and daddy built this Star Wars set on Monday. I think my little boy has Legos on the brain 24 HOURS.A.DAY! 7. Two things that have changed my life are Pinterest and Plan to Eat. Between the two of them I have found tons of new recipes and am more efficient with meal planning and shopping. Wednesday night I made Ham and Cheese Sliders - yummy! 8. Puzzles are great mental exercise and I've discovered keeping one on the dining room table all the time is a good stress reliever for my husband. For two nights now he has come home from work and gone straight to work on the puzzle. This particular one is a Diary of a Wimpy Kid puzzle - it's pretty hard, too. Miss B has read all of the books, so she loved the puzzle, too. 9. Ahhh --- our new favorite book is The Phantom Tollbooth. This is a map of Lands Beyond. I was so excited to be able to download the book for FREE from ePubbud. There are tons of free children's books at this site, and you can even publish your own ebook here -- might be an interesting projects for the kids one day? EPubbud wins my favorite resource this week, too! Not pictured: Learning about Muslims in Story of the World, the next chapters in Writing With Ease, stress-free math (yahoo!) and learning all about birds' eggs in science. Happily linking with my friend Susan, @ Learning ALL the time! !